It was rather refreshing to turn off all the lights and appliances (except some essentials) and sit in the living room with a few candles and the dynamo LED lamp. I didn’t step outside to see if anybody else was participating around us, we simple set to enjoy the hour. Our little chihuahua dog had what could have been a puzzled face as he saw us turn everything off and go dark pretty much, however he soon found comfort next to me (after I sat down) and a few minutes later he was snoring away. Prior to the appointed hour I was reading the comments left in various websites about this event, some wondered if doing this would make any type of impact, if it was just a waste of time and some thought it would be too much of an inconvenience. Personally I think that anything we do can impact our environment, our surroundings either on a positive or negative way, we all have a choices to make, as simple as disposing of a candy wrapper on the street or a garbage receptacle or by reducing the usage of electricity for one hour. In our personal experience it felt like being around the fire on a camping trip, a time to reflect about our current lives, that which we take for granted, and our dependence on modern technology… it was so quiet and peaceful! 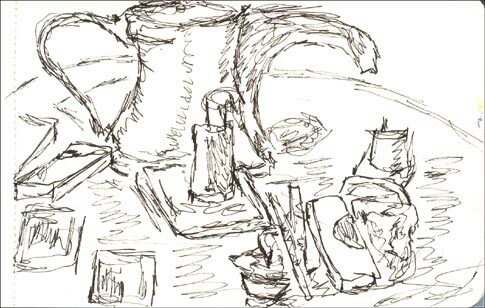 It was too dark to use watercolors, instead I did this quick sketch of the table that was in front of me (micron/moleskin).